Today, the Scholars’ Lab is proud to announce the launch of Neatline, our set of Omeka plugins for hand-crafted geo-temporal visualization and interpretation. You can head right over to http://neatline.org/ to download the 1.0 software, see sample exhibits or play in the sandbox, and read more about the project, including news and history. 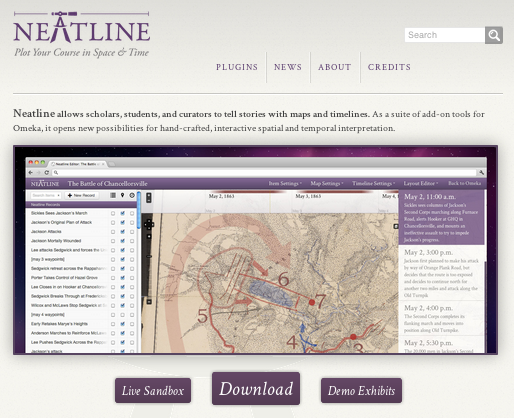 Neatline is a geotemporal exhibit-builder that allows you to create beautiful, complex maps and narrative sequences from collections of archives and artifacts, and to connect your maps and narratives with timelines that are more-than-usually sensitive to ambiguity and nuance. In other words, Neatline lets you make hand-crafted, interactive stories as interpretive expressions of an archival or cultural heritage collection. Every Neatline exhibit can be your own close reading of a humanities collection – expressed in the visual vernacular. Ours is a small-data approach in a “big data” world. Stay tuned to the Scholars’ Lab blog and to Neatline.org for a series of posts and screencasts to be shared over the course of the next two weeks. We’ll be providing support for this open-source software on the Omeka forums and dev list. Cite this post: Bethany Nowviskie. “Announcing Neatline!”. Published July 02, 2012. https://scholarslab.lib.virginia.edu/blog/announcing-neatline/. Accessed on .